As I think I’ve mentioned on this blog before, I struggle with guilt about the most inane things. And guilt about things not so inane. Guilt is a sin and is never a proper motivation for anything. Guilt is arrogance, helping Jesus out in punishing yourself, ignoring or disbelieving that His death on the cross was enough. No for some sins, I need to punish myself a little more. Yuck. I do all that stuff. 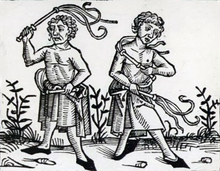 But on the page for self-mortification, I came across mention of medieval flagellants. People who took the Word very literally where it talked about putting the flesh to death and went around whipping themselves with one or more cat o’ nine tails to atone for whatever wrongdoing they’d committed. There was even a picture. I love it. They look soooo stupid. I’m going to hold this image in my head for the next time I start doing this to myself mentally! I have a friend who’s church is very critical of how you live your life – and as a new Christian, he’s struggling to do right…even to the point of not being able to hear me when I tell him that God’s taken away his sin – because he asked God to. Do you know any scripture verses or advice that would help me minister to my friend? Ps 103:12 As far as the east is from the west so far has He removed our transgressions from us. Ro 8:33,34 Who will bring a charge against God’s elect? God is the one who justifies; who is the one who condemns? Christ Jesus is He who died, yes, rather who was raised, who is at the right hand of God, who also intercedes for us.